Redneck Ridge Riders - Tri State Family Off Road Club - Kentucky West Virginia and Ohio Family ATV and SXS Off Road Club and Forum - View topic - Anyone riding any??? Hate to see this place so dead. Anyone been riding any lately? We went to Mud Madness's "season opener" event. They had free BBQ sandwiches, chips, and drinks for lunch. I had never been there. Its not a real big park, but it was a lot of fun. Quite a bit of up and down and some hollers with creeks in them. Really enjoying the RZR. Thanks Rob, yeah I guess the lawnmower business is hitting pretty hard about now. Or at least in a couple weeks it will be. haha. Ive been pretty busy, but on the nicer weekends I have to get the RZR out and go riding. You still testing the Cub side by side, or did you buy one? What all kind of work are you planning to do to it? Yeah think I am gonna get a crew next. I have a two seater that we are doing a project on for me anyway adding lights and stereo. It's turning out pretty good so far. I would like an metal roof and pro armor type doors for it if I can find a good fab shop that is interested. 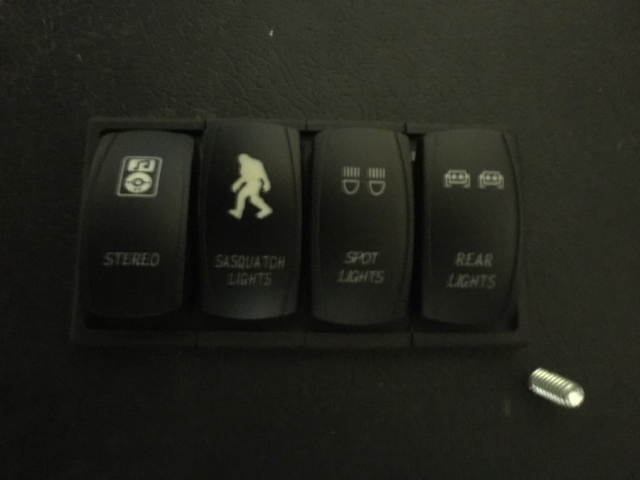 I like the sasquatch lights Planning on putting some kind of LED lighting on mine at some point. Havent decided on one big one or two smaller ones yet. Dont do a lot of night riding but they have gotten cheap enough to be worth having just for the occasion. Id like some doors for mine too, but not sure when Ill do that. Thought about building some 1/4 doors myself, but im not sure what I want to do yet. Mainly would just like to get rid of the nets. Yeah I am running both the big and the little lights. Figure why not sense the price was so right. I think the little ones were 18.00 and the 50" light bar was only 65.00. Gonna be at Rush this evening and all next weekend. Next weekend is their anniversary bash with mega mud trucks and rock bouncers. Also me and Gilley are going to Black Mountain next month the weekend of the 13th.